Telematics market in India is still in the nascent stage but offers high growth opportunities to the market vendors. Though, telematics market in India is relatively old, but has experienced low adoption on account of lack of awareness. However, in the coming years we expect a significant demand from fleet based telematics. Also, with the growing number of cab service providers/vendors, the demand for telematics modules is expected to grow significantly. According to 6Wresearch, India telematics market is expected to reach $113.7 million by 2018, growing at a CAGR of 22.8% during the period 2013-2018. 2.6.1.1 Demand from fleet telematics. Telematics has become one of the fastest emerging markets, especially when we commonly see increasing number of vehicle accidents, rising number of vehicle thefts, demand for navigation services, etc. 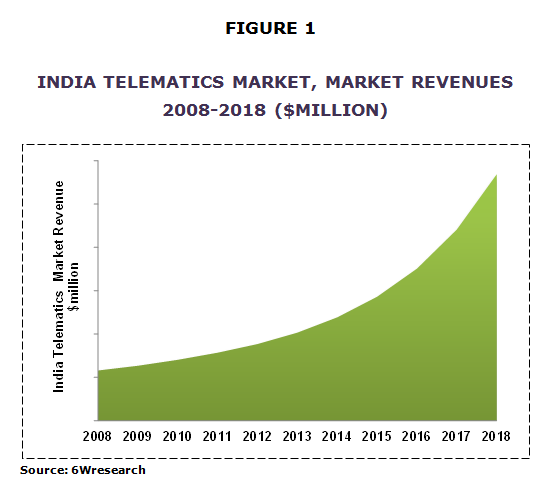 Though, India telematics market is in the nascent stage, but, it offers high growth opportunities to the market vendors. According to 6Wresearch, India telematics market is expected to reach $113.7 million by 2018, growing at a CAGR of 22.8% from 2013-2018.